Not all heroes wear capes – some wear Disney VoluntEARS shirts! And in honor of the program’s 35th Anniversary, thousands of Cast Members worldwide are becoming heroes in their local communities by participating in Disney-sponsored VoluntEARS projects during the first-ever Global Week of Service. The Disney VoluntEARS program started at Disneyland Resort in 1983, when a group of Cast Members formed a team based on Disney’s long legacy of volunteer service. 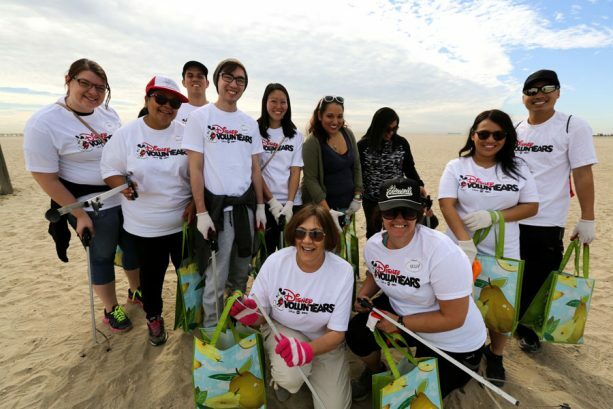 Since then, Disney VoluntEARS have provided more than 10 million hours of volunteer service worldwide in hospitals, at beach cleanups on community playground builds and more. Last year alone, Disney VoluntEARS logged more than 486,000 hours of service and Disney donated more than $ 348 million in cash, in-kind support and product donations to various charities around the world. And on March 7, 2018, Disney VoluntEARS joined forces with the Disney Team of Heroes to commit $ 100 million to children’s hospitals. The Global Week of Service gives Cast Members the chance to shine this week by using their unique skills to change the world. From Imagineers using their mechanical engineering know-how to build bikes for foster care children; to Disneyland Resort Cast Members sorting and distributing 40,000 books for Orange County teachers and students; to the Glendale Creative Campus bagging hundreds of lunches for hungry and homeless around Los Angeles; to Disneyland Paris Cast packing 100,000 meals for families in need across Europe; the activities are as diverse and inspirational as our Cast Members. Cast even have the opportunity to turn their hours of volunteer service into a financial contribution to one of thousands of charitable organizations, through the EARS to You grant program. Our Disney VoluntEARS prove that there is a hero in all of us! Happy Anniversary to the Disney VoluntEARS, and watch out for more stories about the Global Week of Service.